My boyfriend is an unapologetic, certified marshmallow hater. I know -- sometimes it's hard to love him. But I persevere, and somehow he endures all the weird crap I throw out there, too. Like when I get nervous that automatic doors won't open. Or my never-ending hatred of mayonnaise. So when I yelled at him from the kitchen (over my Drop Dead Diva and his Madden) that I was making a batch of soft, homemade marshmallows I didn't get much of a reaction. When I coated them in chocolate and graham crackers, well, suddenly the unappealing sugar pillows of five minutes ago were something he couldn't shove in his mouth fast enough. 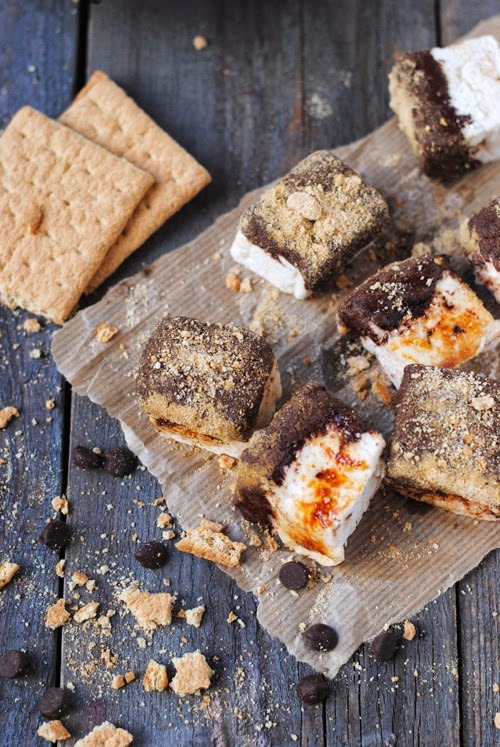 Turns out S'mores Marshmallows can exorcise the marshmallow hater inside us all. 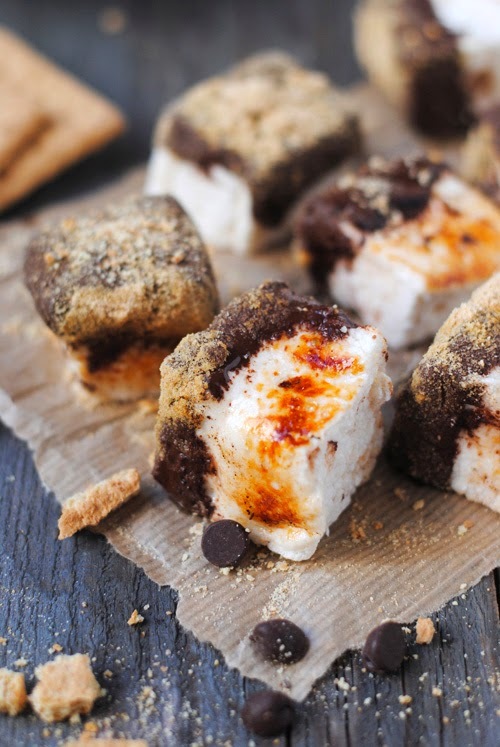 You could make these with store bought marshmallows, but it really won't be the same. I recommend either following the recipe below or ordering from a marshmallow guru like my friend Kimberley over at Kimberley's Kitchen. Seriously, she makes marshmallow magic. For extra fun, toast each marshmallow. I used one of those long barbecue lighters, but any form of fire will do. Want to see some behind the scenes treats? Follow me on instagram! Begin by making the marshmallows. Butter a 9x9 or 9x11 (if you want thinner marshmallows) pan and set aside. In a small pot, bring 1/2 cup of the water, the sugar, the corn syrup, and the salt to a boil, stirring frequently. Let it boil for a minute, then remove from the heat. Pour the remaining 1/2 of water into the bowl of a stand mixer, and sprinkle with the gelatin. Let sit for a few minutes to get all getaliny. Once things soak up a bit, turn the mixer to low and slowly pour in the boiled sugar mixture. Turn to high and whip the crap out of it for about 10 minutes. It will grow to about three times its size, so be ready to scrap down the bowl if need be. Once it's thick and big, add the vanilla and mix until incorporated. Pour the mixture into the prepared pan, even out the top, and cover it all tightly with a butter-lined piece of plastic wrap. Let sit until firm -- ideally overnight, but at least several hours. Once ready to cut the marshmallows, sprinkle a large work surface with a generous amount of icing sugar and flip the marshmallows out on top. Rub the marshmallow slab with the icing sugar until it isn't sticky anymore. Slice into 1x1 inch (or whatever size you want) marshmallows, and rub each one with icing sugar. Once the marshmallows are cut, it's time for the fun part. 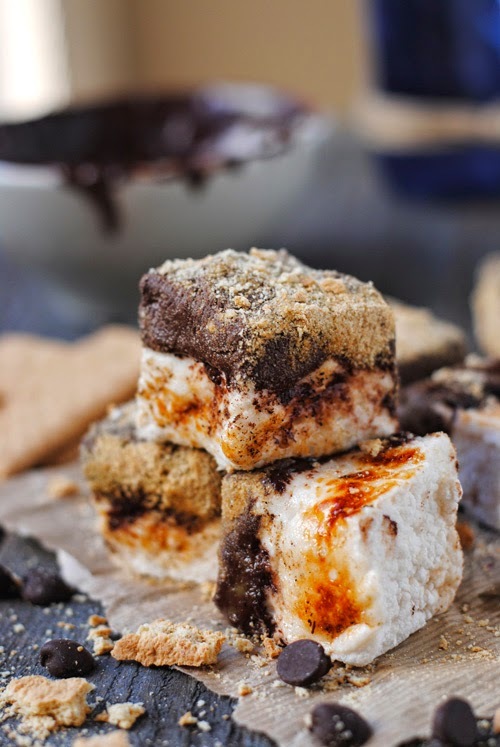 Melt the chocolate on half power in the microwave and dip each marshmallow until one half is well coated. Set aside on a cookie rack over some parchment. Once you've done a few and they've sat for a minute or two, dip them in the crushed graham crackers and place back on the rack to dry. Repeat for the remaining marshmallows.